The pieces in the Virtual Amarna Museum come from the site of Tell el-Amarna in Egypt, the city built around 1350 BC by Pharaoh Akhenaten, as a place where he could centre his austere view of the cult of the sun, the Aten. The pieces illustrate not Akhenaten's own concerns, but the spiritual interests of the many thousands of people who came to live in the city. Although we can count Akhenaten as a monotheist, he seems not to have attempted an intolerant suppression of the beliefs and practices of most of his people. They continued to follow what was familiar to them, though we should not count this necessarily as a rejection of Akhenaten's ideas. Imposed conformity of belief belongs to much later periods of history, in Egypt and elsewhere. During the spring of 2008 and 2009, staff from the University of Arkansas, Center for Advanced Spatial Technologies (Katie Simon and Christopher Goodmaster) joined the British archaeological mission to Tell el-Amarna (directed by Barry Kemp), bringing with them a 3D laser scanner. 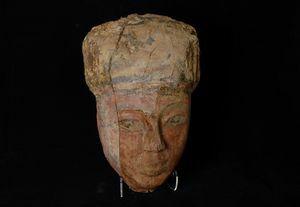 A series of objects housed in the site antiquities magazine (that is maintained under the supervision of the Supreme Council of Antiquities of Egypt) was selected for scanning, as an experiment in this form of recording. The selection was done by archaeologist Anna Stevens and was intended to illustrate the theme of personal religion at Amarna. It reflected a piece of research, 'Investing in religion in Akhenaten's Amarna', that had been funded by the Templeton Foundation through the University of Cambridge and had been conducted by Barry Kemp and Anna Stevens between 2006 and 2008. The small selection cannot illustrate the theme fully. It was made essentially to enable an experiment in recording method to take place. B. Kemp, The City of Akhenaten and Nefertiti; Amarna and its People. London, Thames and Hudson 2012. Kemp B. 1977 'The city of El-Amarna as a source for the study of urban society in ancient Egypt', World Archaeology 9(2), 12339. This digital archive was undertaken in conjunction with an electronic publication through the Linking Electronic Archives and Publications II (LEAP II) project, funded by the Andrew W. Mellon Foundation. The corresponding article is 'Developing a 3-D Digital Heritage Ecosystem: from object to representation and the role of a virtual museum in the 21st century' (2011) by Fred Limp, Angie Payne, Katie Simon, Snow Winters and Jack Cothren, which can be found in Internet Archaeology 30.